Manuel Galrinho Bento was a Portuguese professional footballer who played as a goalkeeper. 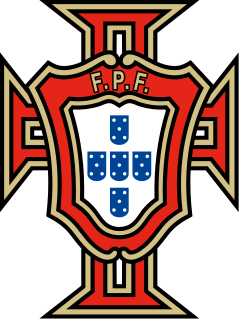 The Portugal national football team represents Portugal in international men's association football competition since 1921. It is controlled by the Portuguese Football Federation, the governing body for football in Portugal. Sport Lisboa e BenficaComC MHIH OM, commonly known as Benfica, is a sports club based in Lisbon, Portugal. It is best known for the professional football team playing in the Primeira Liga, the top flight of the Portuguese football league system, where they are the most successful club in terms of titles won. Doris Hilda Anderson, was a Canadian author, journalist and women's rights activist. She is best known as the editor of the magazine Chatelaine who mixed traditional content with thorny social issues of the day, putting the magazine on the front lines of the feminist movement in Canada. Her activism beyond the magazine helped drive social and political change in the country, enshrining women's equality and making her one of the most well-known names in the women's movement in Canada. Chatelaine is an English-language Canadian women's magazine which covers topics from food, style and home décor to politics, health and relationships. Chatelaine and its French-language version, Châtelaine, are published by Rogers Media, a division of Rogers Communications. Thomas Savig Kleppe was an American politician who served as the Representative from North Dakota. He was also the Administrator of the Small Business Administration and the U.S. Secretary of the Interior. Osvaldo Cavandoli, also known by his pen name Cava, was an Italian cartoonist. His most famous work is his series of short animated cartoons, La Linea. James Kaldis was a Greek-born Australian politician. He was a Labor member of the New South Wales Legislative Council from 1978 to 1999. Benito "Veleno" Lorenzi was an Italian footballer born in Borgo a Buggiano, province of Pistoia. He played as a striker. Natalie Bodanya was an American operatic soprano who had an active international career from the late 1920s through the 1940s. She notably sang at the Metropolitan Opera in New York City from 1937 through 1942 and was a performer with the New York City Opera during the company's 1943-1944 inaugural season. 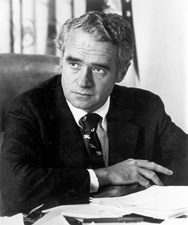 Thomas Francis Eagleton was a United States Senator from Missouri, serving from 1968 to 1987. He is best remembered for briefly being the Democratic vice presidential nominee under George McGovern in 1972. He suffered from bouts of depression throughout his life, resulting in several hospitalizations, which were kept secret from the public. When they were revealed, it humiliated the McGovern campaign and Eagleton was forced to quit the race. He later became adjunct professor of public affairs at Washington University in St. Louis. Bob Hattoy was an American activist on issues related to gay rights, AIDS and the environment. Alan Black was known as one of the presenters of BBC's Sounds of the Seventies. Joseph H. Conlin was an American impresario and opera director. Born in Chicago, Conlin founded Conlin Associates, a New York based talent management agency which presented many important European artists via United States tours, including Beniamino Gigli, Jussi Björling, and Renata Tebaldi. He also served as the General Director of the Palm Beach Opera during the 1980s. At the time of his death in West Palm Beach, Florida he was president of the Musicians' Club of New York and was still active as a concert presenter. Yvan Delporte was a Belgian comics writer, and was editor-in-chief of Spirou magazine between 1955 and 1968 during a period considered by many the golden age of Franco-Belgian comics. He is credited with several creative contributions, among these his collaborations with Peyo on The Smurfs, with René Follet on Steve Severin (1/2) and André Franquin with the creation of Gaston Lagaffe and the co-authorship of Idées noires. The following is a list of notable deaths in November 2005. ↑ "Benfica legend Bento mourned". UEFA . March 1, 2007. Archived from the original on March 3, 2007. Retrieved September 1, 2018. ↑ "Otto Brandenburg død". Politiken (in Danish). March 1, 2007. Retrieved September 1, 2018. ↑ "Colette Brosset, dernière vadrouille". Libération (in French). March 3, 2007. Archived from the original on August 24, 2008. Retrieved March 20, 2007. ↑ "Belizean icon George Gabb dead at 79". Channel 5 . March 2, 2007. Archived from the original on September 29, 2007. Retrieved March 9, 2007. ↑ "Sir Sydney Gun-Munro Passes". Government of St. Vincent and The Grenadines. March 2, 2007. Archived from the original on October 12, 2007. Retrieved October 12, 2007. ↑ Nkatazo, Lebo. "Deputy minister Rusere dies". NewZimbabwe.com. Archived from the original on March 12, 2007. Retrieved March 20, 2007. ↑ Peeler, Tim. "NC State Legend Bobby Speight, 76, Passes Away". Gopack.com. Retrieved September 1, 2018. ↑ Martin, Sandra (March 2, 2007). "Women's rights champion Doris Anderson dies at 85". The Globe and Mail . Archived from the original on March 4, 2007. Retrieved August 31, 2017. ↑ Schudel, Matt (March 4, 2007). "Thomas Kleppe, 87; Interior Secretary During Mid-1970s". The Washington Post. Retrieved September 1, 2018. ↑ "Clem Labine dead at 80". ESPN. March 2, 2007. Retrieved September 1, 2018. ↑ Giardina, Carolyn (March 6, 2007). "Production designer Harold Michelson dies". The Hollywood Reporter . Retrieved September 1, 2018. ↑ "Former Ga. Tech player Mike Mooney dies in his sleep". CBS Sportsline. March 7, 2007. Archived from the original on February 3, 2013. Retrieved September 1, 2018. ↑ Harding, Luke (March 7, 2007). "Mystery over Russian journalist's death fall". The Sydney Morning Herald . Retrieved September 1, 2018. ↑ Estrada, Louie (March 18, 2007). "William Sturtevant, curator and scholar at the Smithsonian". The Boston Globe . Retrieved September 1, 2018. ↑ "Eminent French writer Troyat dies". BBC News. March 5, 2007. Retrieved September 1, 2018. ↑ DeMott, Rick (March 6, 2007). "La Linea Creator Osvaldo Cavandoli Dies". Animation World Network . Retrieved September 1, 2018. ↑ "The Hon. (Jim) James Kaldis (1932–2007)". Parliament of New South Wales. September 29, 2008. Archived from the original on June 5, 2011. Retrieved December 21, 2009. ↑ "Inter legend Lorenzi dies". Internazionale Milano. March 3, 2007. Retrieved September 1, 2018. ↑ Tomlin, Dan (March 5, 2007). "Hall of Famer, former Cub Gene Oliver, 71, dies". Quad-Cities Online. Retrieved September 1, 2018– via The Deadball Era. ↑ "Saul Swimmer, 70, Film Documentarian, Dies". The New York Times. March 22, 2007. Retrieved September 1, 2018. ↑ Fox, Margalit (March 11, 2007). "Marjabelle Y. Stewart, 82, White-Gloved Author, Dies". The New York Times . Retrieved September 1, 2018. ↑ Midgette, Anne (March 10, 2007). "Natalie Bodanya, 98, Soprano at Metropolitan, Dies". The New York Times. Retrieved September 1, 2018. ↑ Mannies, Jo (March 4, 2007). "Senator and statesman, Thomas Eagleton dies at 77". St. Louis Post-Dispatch . Archived from the original on March 15, 2007. Retrieved March 20, 2007. ↑ Woo, Elaine (March 6, 2007). "Bob Hattoy, 56; witty and outspoken advocate for the environment, AIDS research". Los Angeles Times. Retrieved September 1, 2018. ↑ Reed, Kristan (March 5, 2007). "Richard Joseph dies". Eurogamer . Retrieved September 1, 2018. ↑ "JMM MP Mahato shot dead by naxals". The Hindu . March 5, 2007. Retrieved September 1, 2018. ↑ "Tadeusz Nalepa nie żyje". Interia (in Polish). March 4, 2007. Archived from the original on March 15, 2007. Retrieved September 1, 2018. ↑ "Robert Prince (I) (1929–2007)". IMDb . Retrieved September 1, 2018. ↑ Kozinn, Allan (March 14, 2007). "John Thow, 57, Composer, Dies". The New York Times. Retrieved September 1, 2018. ↑ Hardingham-Gill, Tamara (December 30, 2007). "The half ton mum: Tragic story of world's heaviest woman". Daily Mail . Retrieved September 1, 2018. ↑ "Journalist Wooldridge dies at 75". BBC News. March 5, 2007. Retrieved September 1, 2018. ↑ "Alan Black, Radio DJ and cartoonist". The Scotsman . March 27, 2007. Retrieved September 1, 2018. ↑ "Joseph H. Conlin". The Palm Beach Post . March 20, 2007. Retrieved September 1, 2018– via Legacy.com. ↑ "Décès du scénariste Yvan Delporte". La Libre Belgique (in French). March 5, 2007. Retrieved September 1, 2018. ↑ "Milton N. (Buddy) Hopkins, Jr". CurrentObituary.com. March 5, 2007. Retrieved September 1, 2018. ↑ Cheney, David M. "Bishop José Ivo Lorscheiter". Catholic Hierarchy. Retrieved September 1, 2018. ↑ "Ivan Supek (1915–2007)". Inter-University Centre Dubrovnik. March 12, 2007. Retrieved September 1, 2018. ↑ "French thinker Baudrillard dies". BBC News. March 7, 2007. Retrieved September 1, 2018. ↑ Oliver, Greg (March 6, 2007). "Bad News Allen dies suddenly". SLAM! Wrestling . Retrieved September 1, 2018. ↑ Ashish (March 6, 2007). "Bad News Brown Passes Away". 411mania.com. Retrieved September 1, 2018. ↑ Marquis, Dave; Johnson, C. (March 6, 2007). "Wine Industry Icon Ernest Gallo Dies at 97". KXTV . Archived from the original on March 27, 2007. Retrieved September 1, 2018. ↑ "Quatre candidats en lice". L'Obs (in French). March 7, 2007. Archived from the original on March 11, 2007. Retrieved September 1, 2018. ↑ Oliver, Greg (March 6, 2007). "Ray "Thunder" Stern dead at 74". SLAM! Wrestling. Retrieved September 1, 2018. ↑ Burnham, Emily (March 9, 2007). "'Legend of North Country' Bill Chinnock dies at 59". Sun Journal . Archived from the original on March 12, 2007. Retrieved March 12, 2007. ↑ Holroyd, Jane (March 9, 2007). "Skaters 'lost' without gifted Cross". The Age . Retrieved September 1, 2018. ↑ "Oregon musician Paul deLay dies". Seattle Post-Intelligencer . March 7, 2007. Archived from the original on October 21, 2012. Retrieved September 1, 2018. ↑ "Hidas, Frigyes". Universal Music Publishing . 2017. Retrieved September 1, 2018. ↑ "Obituary: Emil Mailho". East Bay Times . March 10, 2007. Retrieved September 1, 2018. ↑ Stephens, Tony; Snow, Deborah (March 10, 2007). "Head up, goals achieved". The Sydney Morning Herald . Retrieved September 1, 2018. ↑ "Neil North, Star of 'The Winslow Boy' (1948)". The Independent . March 19, 2007. Archived from the original on July 1, 2011. Retrieved September 1, 2018. ↑ Cohen, Sandy (March 8, 2007). "TV Sports Pioneer Andy Sidaris Dies". The Washington Post . Retrieved September 1, 2018. ↑ "Famous Yorkshire boxer dies at 60". Yorkshire Evening Post . March 13, 2007. Retrieved September 1, 2018. ↑ "Lady Thorneycroft". The Daily Telegraph . March 15, 2007. Retrieved September 1, 2018. ↑ "Billy Walkabout, decorated American Indian veteran, dies at 57". USA Today . March 11, 2007. Retrieved September 1, 2018. ↑ "Taufik Cotran". The Times . May 3, 2007. Retrieved September 1, 2018. ↑ "Hall of Famer Shadow passes away". Wrestling Observer . March 9, 2007. Archived from the original on March 12, 2007. Retrieved September 1, 2018. ↑ "John Inman Dies, Aged 71". Sky News . March 8, 2007. Archived from the original on March 10, 2007. Retrieved September 1, 2018. ↑ "Comedy actor Inman dies aged 71". BBC News. March 8, 2007. Retrieved September 1, 2018. ↑ "Mourning: Tom Moldvay Passes". Creative Mountain Games. April 19, 2007. Archived from the original on October 8, 2007. Retrieved April 20, 2007. ↑ "Harold M. Ryan, '35 - 1911–2007". University of Detroit Mercy School of Law . Archived from the original on July 14, 2007. Retrieved September 1, 2018. ↑ "Richard Trexler, noted historian, dies at age 74". Inside Binghamton. Vol. 28 no. 24. Binghamton University. March 22, 2007. Archived from the original on August 7, 2011. Retrieved September 1, 2018. ↑ "Η ηθοποιός Βίκυ Βανίτα βρέθηκε νεκρή μέσα στο διαμέρισμα της". In.gr (in Greek). March 8, 2007. Archived from the original on March 10, 2007. Retrieved September 1, 2018. ↑ Mandel, Ken (March 8, 2007). "Vukovich passes away at 59". Major League Baseball . Retrieved September 1, 2018. ↑ "Remembering Rosy Afsari". The Daily Star . 5 (988). March 11, 2007. Retrieved September 1, 2018. ↑ "Family: Rocker Brad Delp's death was suicide". The Boston Globe . March 14, 2007. Retrieved September 1, 2018. ↑ "Minute's silence for former AFL chairman". ABC News . March 9, 2007. Archived from the original on March 11, 2007. Retrieved March 20, 2007. ↑ "Glen Harmon". Manitoba Hockey Hall of Fame and Museum. Archived from the original on February 15, 2012. Retrieved September 1, 2018. ↑ "Jack Kirby, 84; scored the touchdown that sent USC to Rose Bowl in '48". Los Angeles Times. March 21, 2007. Retrieved September 1, 2018. ↑ "Sen. Jeanne Hopkins Lucas". News & Record . March 11, 2007. Archived from the original on March 14, 2012. Retrieved September 1, 2018. ↑ Codispoti, Amanda (March 9, 2007). "Thomas Mason, former attorney, actor, dies at 88". The Roanoke Times . Archived from the original on October 10, 2012. Retrieved September 1, 2018. ↑ "Ulpio Minucci passes away at 89". Robotech.com. March 14, 2007. Archived from the original on March 28, 2007. Retrieved March 23, 2007. ↑ "Fallece el sociólogo argentino Juan Carlos Portantiero". El Universal (in Spanish). March 11, 2007. Retrieved September 1, 2018. ↑ "American Samoa attorney general dies". The Honolulu Advertiser . March 10, 2007. Retrieved September 1, 2018. ↑ Rution, Joe (April 10, 2007). "Brian "Buddy" Allin 1944–2007". Santa Barbara Independent . Retrieved September 1, 2018. ↑ Sanders, Robert (March 13, 2007). "Famed paleoanthropologist Clark Howell has died". UC Berkeley News. Retrieved September 1, 2018. ↑ "Autopsy Results Pending On Richard Jeni". CBS News. March 12, 2007. Archived from the original on March 24, 2007. Retrieved March 20, 2007. ↑ Deriso, Nick (March 11, 2007). "Ernie Ladd, hall of fame football player and wrestler, has died". The News-Star . Archived from the original on March 15, 2007. Retrieved September 1, 2018. ↑ "Lanna Saunders, 65; played Sister Marie on 'Days of Our Lives'". Los Angeles Times. March 15, 2007. Retrieved September 1, 2018. ↑ Pigott, Johanna; Glover, Richard (March 22, 2007). "A comic delighted by the absurdities of life - Obituaries". The Sydney Morning Herald . Retrieved September 1, 2018. ↑ "Cork legend Creedon dies". Hoganstand.com. March 12, 2007. Archived from the original on October 20, 2012. Retrieved September 1, 2018. ↑ Thomas, Bob (March 13, 2007). "Betty Hutton, Hollywood actress: 86". Toronto Star . Retrieved September 1, 2018. ↑ Abel, David (March 12, 2007). "Justice Sosman of the SJC dies at 56". The Boston Globe. Retrieved September 1, 2018. ↑ Khouri, Andy (March 12, 2007). "'Doom Patrol' Creator Arnold Drake Dies". Comic Book Resources.com. Archived from the original on May 17, 2011. Retrieved September 1, 2018. ↑ McLellan, Dennis (March 20, 2007). "Vilma Ebsen, 96; dancer teamed with her brother Buddy on stage". Los Angeles Times. Retrieved September 1, 2018. ↑ Brittain, Victoria (March 13, 2007). "Jack Gaster". The Guardian. Retrieved September 1, 2018. ↑ "Maha Ghosananda, Buddhist leader and peace prize nominee, dies". WPRI-TV . March 13, 2007. Archived from the original on September 27, 2007. Retrieved March 20, 2007. ↑ "Norm Larker". Retrosheet.org. Retrieved September 1, 2018. ↑ "Juan Enrique Lira". Sports Reference . Retrieved September 1, 2018. ↑ "Muere el ex secretario de Hacienda Antonio Ortiz Mena". El Universal (in Spanish). March 13, 2007. Retrieved September 1, 2018. ↑ Tan, Joceline (March 14, 2007). "Passing of a fiery politician". The Star . Archived from the original on June 8, 2011. Retrieved September 1, 2018. ↑ "Biografie von Herbert Fux". Austrian Parliament (in German). Retrieved September 1, 2018. ↑ "Ex-PM Major's elder brother dies". BBC News. April 20, 2007. Retrieved September 1, 2018. ↑ "Wendy Reves, 90, Museum Benefactor, Dies". The New York Times. March 17, 2007. Retrieved September 1, 2018. ↑ Hoey, Michael (May 3, 2007). "John Sinclair". The Guardian. Retrieved September 1, 2018. ↑ DeBlasi, Anthony (March 14, 2007). "Legendary Wrestler, Manager, WWE Hall of Famer, Arnold Skaaland Passes Away at 82". Wrestling News.com. Archived from the original on March 17, 2007. Retrieved March 20, 2007. ↑ Lefort, Gérard (March 15, 2007). "Nicole Stéphane, la mort d'une enfant terrible". Libération (in French). Retrieved September 1, 2018. ↑ "French Resistance hero dies at 94". BBC News. March 15, 2007. Retrieved September 1, 2018. ↑ "The Olympic champion, France's Roger Beaufrand". Museo Ciclismo. Retrieved September 1, 2018. ↑ Scholes, Tony (September 27, 2007). "Cavanagh dies". Scottish Fitba.net. Archived from the original on September 27, 2007. Retrieved September 1, 2018. ↑ "Former Head Football Coach Lloyd Eaton Died". Alma College . March 21, 2007. Archived from the original on September 27, 2007. Retrieved September 5, 2007. ↑ "Saddam's ally, former Iraqi Baath party leader and prime minister, dies". International Herald Tribune . March 16, 2007. Archived from the original on March 20, 2007. Retrieved September 1, 2018. ↑ "'The Golden Voice' Mighty Terror dies at 86". Trinidad and Tobago Express . March 15, 2007. Archived from the original on November 21, 2007. Retrieved March 20, 2007. ↑ "Gareth Hunt, in 'New Avengers,' Dies at 65". The New York Times. March 15, 2007. Retrieved September 1, 2018. ↑ "Past Player Profiles: McEwin, Ron L." Essendon Football Club . 2009. Archived from the original on October 12, 2009. Retrieved September 1, 2018. ↑ "Birk Ernest Sproxton". Winnipeg Free Press . March 18, 2007. Retrieved September 1, 2018. ↑ "Blanquita Amaro (1923–2007)". Find a Grave . Retrieved September 1, 2018. ↑ "Sally Clark dies at family home". BBC News. March 16, 2007. Retrieved September 1, 2018. ↑ Robbins, Maro; Contreras, Guillermo (March 21, 2007). "Judge Wood's assassin dies of heart attack". San Antonio Express-News . Archived from the original on March 26, 2007. Retrieved September 1, 2018. ↑ Astor, Dave (March 16, 2007). "King Features Editor in Chief Jay Kennedy Dies in Drowning Accident". Editor & Publisher . Archived from the original on March 26, 2007. Retrieved March 20, 2007. ↑ "Former commissioner Kuhn dies at 80". ESPN. March 16, 2007. Retrieved September 1, 2018. ↑ "Marty Martinez Stats". Baseball Almanac.com. Retrieved September 1, 2018. ↑ Alexander, Brian (March 16, 2007). "Retired Rep. Jack Metcalf was also fisherman, teacher". The Seattle Times . Archived from the original on March 19, 2007. Retrieved March 19, 2007. ↑ "Machap rep dies at 55". The Star . March 16, 2007. Archived from the original on March 19, 2007. Retrieved August 31, 2018. ↑ Noland, Claire (March 18, 2007). "Stuart Rosenberg, 79; never returned to TV after directing 'Cool Hand Luke'". Los Angeles Times. Retrieved September 1, 2018. ↑ Burlingame, Jon (March 23, 2007). "Film composer Stein dies at 91". Variety . Retrieved September 1, 2018. ↑ Nau, Jean-Yves (March 20, 2007). "Jean Talairach". Le Monde (in French). Retrieved September 1, 2018. ↑ "Dirk Wayenberg". Cycling Archives. Retrieved September 1, 2018. ↑ "Mr Ivan Joseph Welsh". Parliament of New South Wales. October 20, 2012. Archived from the original on October 20, 2012. Retrieved September 1, 2018. 1 2 "Bangladesh's Manjural Islam killed in road accident". ESPN CricInfo. March 16, 2007. Retrieved September 1, 2018. ↑ "Madero Belden, Pablo Emilio". Our Campaigns.com. Retrieved September 1, 2018. ↑ "Sir Arthur Marshall". The Daily Telegraph. March 17, 2007. Retrieved September 1, 2018. ↑ "Steve McCooke". Sports Reference. Retrieved August 31, 2018. ↑ Kennedy, Randy (March 20, 2007). "Raymond D. Nasher, 85, Dallas Art Collector Who Built a Museum, Dies". The New York Times. Retrieved September 1, 2018. ↑ "Carol Richards (I) (1922–2007)". Internet Movie Database. Retrieved September 1, 2018. ↑ "Tupper Saussy, a Grammy-nominated songwriter, dies at 70". The Star . March 20, 2007. Archived from the original on May 21, 2011. Retrieved August 31, 2018. ↑ Lohr, Steve (March 19, 2007). "John W. Backus, 82, Fortran Developer, Dies". The New York Times. Retrieved September 1, 2018. ↑ "Legacy Five Pianist Roger Bennett Dies". The Chattanoogan . March 17, 2007. Retrieved September 1, 2018. ↑ "Joseph Casdin (1909–2007)". Find a Grave. Retrieved September 1, 2018. ↑ "Boisterous Cowboys fan 'Crazy Ray' dies at 76". ESPN. March 18, 2007. Retrieved September 1, 2018. ↑ "Monkey World boss Jim Cronin dies". BBC News. March 20, 2007. Retrieved September 1, 2018. ↑ Whitaker, Sheila (March 21, 2007). "Freddie Francis: Double Oscar-winning cinematographer". The Guardian. Retrieved September 1, 2018. ↑ Smith, Craig (March 27, 2007). "Homer Harris, 1916-2007: Dermatologist, a sports pioneer". The Seattle Times . Retrieved September 1, 2018. ↑ Blyth, Alan (March 20, 2007). "Ernst Haefliger: Versatile Swiss tenor". The Guardian. Retrieved September 1, 2018. ↑ "Israeli Author, Peace Activist Tanya Reinhart Dies at 63". Democracy Now! . March 19, 2007. Archived from the original on November 14, 2007. Retrieved September 1, 2018. ↑ "Ion Santo". Sports Reference. Retrieved September 1, 2018. ↑ "John Churchill Williams". Cricket Archive.com. Retrieved September 1, 2018. ↑ Stephens, Tony (April 2, 2007). "Businessman and martial artist packed a punch". The Sydney Morning Herald . Retrieved September 1, 2018. ↑ "Coach Woolmer 'was not murdered'". BBC News. June 2, 2007. Retrieved September 1, 2018. ↑ Boodram, Kim (March 20, 2007). "Economist Lloyd Best dies at 73". Trinidad and Tobago Express . Archived from the original on October 19, 2007. Retrieved September 1, 2018. ↑ "Giampaolo Calanchini". Sports Reference. Retrieved September 1, 2018. ↑ Gorman, Steve (March 22, 2017). "Man who played Letterman's Larry "Bud" Melman dies". Reuters. Retrieved September 1, 2018. ↑ "Robert Dickson n'est plus". Radio-Canada (in French). March 20, 2007. Retrieved September 1, 2018. ↑ Friedman, Roger (March 20, 2007). "R&B Great Luther Ingram Dies at 69". Fox News Channel. Archived from the original on March 28, 2007. Retrieved September 1, 2018. ↑ "Actress Elaine Shore, 78; D.C. Theater Co-Founder". The Washington Post. April 3, 2007. Retrieved August 31, 2018. ↑ "Former Eskimo Bill Stevenson dies". CBC Sports. March 20, 2007. Retrieved September 1, 2018. ↑ Traubmann, Tamara (March 21, 2007). "Shimon Tzabar, 81, Dies in London". Haaretz . Retrieved September 1, 2018. ↑ "Gemunu Wijesuriya's voice is no more". Daily News . March 21, 2007. Retrieved September 1, 2018. ↑ Balogun, Sola; Amatus, Azuh (March 23, 2007). "Top Nollywood actor, Francis Agu is dead". Daily Sun . Retrieved September 1, 2018. ↑ "Albert Baez, 94, Scientist and Singers' Father, Dies". The New York Times. March 27, 2007. Retrieved September 1, 2018. ↑ Sullivan, Patricia (March 23, 2007). "Olcott Deming; Diplomat, First Ambassador to Uganda". The Washington Post. Retrieved September 1, 2018. ↑ "Raynald Fréchette n'est plus". Radio-Canada (in French). January 15, 2013. Archived from the original on January 15, 2013. Retrieved September 1, 2018. ↑ "Mi'kmaq poet laureate Rita Joe dead at 75". The Globe and Mail . March 21, 2007. Archived from the original on September 6, 2008. Retrieved September 1, 2018. ↑ Hevesi, Dennis (March 22, 2007). "Bishop G. E. Patterson, 67, Who Led Church of God in Christ, Dies". The New York Times. Retrieved September 1, 2018. ↑ "Iraq News: Former VP to be hanged". CNN. March 19, 2007. Archived from the original on March 19, 2007. Retrieved March 20, 2007. ↑ "John P. Ryan, 70, actor". Variety. March 27, 2007. Retrieved September 1, 2018. ↑ Magee, Jerry (March 21, 2007). "Former Charger Ernie Wright dies". The San Diego Union-Tribune . Archived from the original on March 28, 2007. Retrieved April 1, 2007. ↑ ""Iron lady" is no more". GhanaWeb. March 20, 2007. Retrieved September 1, 2018. ↑ "Drew Hayes Dies". Newsarama.com. March 24, 2007. Archived from the original on September 29, 2007. Retrieved April 1, 2007. ↑ Ulekleiv, Morten; Ryste, Camilla (March 21, 2007). "Sven O. Høiby er død". Verdens Gang (in Norwegian). Retrieved September 1, 2018. ↑ Nelson, Valerie J. (March 22, 2007). "Catherine Seipp, 49; conservative media critic who took on the L.A. Times". Los Angeles Times. Retrieved September 1, 2018. ↑ "Nisar Bazmi dies at 83". Daily Times . March 23, 2007. Archived from the original on September 30, 2007. Retrieved April 1, 2007. ↑ "Don Dennis". Historic Baseball. Retrieved September 1, 2018. ↑ "U. G. Krishnamurti passes away". The Hindu . March 24, 2007. Archived from the original on September 27, 2007. Retrieved April 1, 2007. ↑ "Falleció el ex diputado Daniel Díaz Maynard". El Espectador (in Spanish). March 22, 2007. Archived from the original on September 27, 2007. Retrieved March 23, 2007. ↑ "César Peñaranda". Sports Reference. Retrieved September 1, 2018. ↑ "Medal of Honor Recipient Jay Zeamer Jr., 88". The Washington Post. March 28, 2007. Retrieved September 1, 2018. ↑ "Former baseball pro Bailey dies at 75". Knoxville News Sentinel . March 24, 2007. Retrieved September 1, 2018– via The Deadball Era.com. ↑ Levy, Dawn (March 28, 2007). "Paul Cohen, winner of world's top mathematics prize, dies at 72". Stanford University . Retrieved September 1, 2018. ↑ "Late Chinese leader Mao Zedong's son dies at 84". The San Diego Union-Tribune . March 24, 2007. Archived from the original on February 2, 2013. Retrieved September 1, 2018. ↑ "Olympic cyclist died in Burnley inferno". The West Australian . March 25, 2007. Archived from the original on September 30, 2007. Retrieved April 1, 2007. ↑ "Medlen succumbs to injuries suffered in recent testing accident". National Hot Rod Association. March 23, 2007. Archived from the original on May 15, 2008. Retrieved March 25, 2007. ↑ "Air Force legend Col. Chase Nielsen passes away". U.S. Air Force. March 25, 2007. Archived from the original on December 12, 2012. Retrieved September 1, 2018. ↑ O'Dell, John (March 25, 2007). "From a humble start, he found a road to success". Los Angeles Times. Retrieved September 1, 2018. ↑ Sisario, Ben (March 24, 2007). "Walter J. Turnbull, 62, Harlem Choir Founder, Dies". The New York Times. Retrieved September 1, 2018. ↑ "Former PBA big wig Jun Bernardino dies; 59". ABS-CBN News . March 24, 2007. Archived from the original on September 26, 2007. Retrieved August 27, 2012. ↑ "Country Singer Henson Cargill Dies". Billboard . March 27, 2007. Retrieved September 1, 2018. ↑ Martin, Douglas (April 17, 2007). "Mary D. Crisp, 83, Feminist G.O.P. Leader, Dies". The New York Times. Retrieved September 1, 2018. ↑ "Maurice Flitcroft". The Times . March 28, 2007. Archived from the original on May 23, 2011. Retrieved September 1, 2018. ↑ "Former 1st Lady dies at age 81". Billings Gazette . Retrieved September 1, 2018. ↑ Moag, Jeff (June 2007). "Invincible: Martin Studach". Rowing News. Vol. 14 no. 4. p. 31. Retrieved September 1, 2018. ↑ "Chief Justice is dead". GhanaWeb. March 25, 2007. Retrieved September 1, 2018. ↑ Altman, Lawrence K. (March 30, 2007). "Robert Austrian, 90, Dies; Developed Major Vaccine". The New York Times. Retrieved September 1, 2018. ↑ "Jerry Girard, WPIX Sports Broadcaster, Dies at 74". The New York Times. March 27, 2007. Retrieved September 1, 2018. ↑ "Armenian PM dies of heart attack". BBC News. March 25, 2007. Retrieved September 1, 2018. ↑ "Marshall Rogers Dies". Newsarama. March 26, 2007. Archived from the original on April 1, 2007. Retrieved April 1, 2007. ↑ "E' morto Beniamino Andreatta". Rai News24 (in Italian). March 26, 2007. Archived from the original on November 20, 2007. Retrieved September 1, 2018. ↑ "Cha Burns". The Herald . April 3, 2007. Retrieved September 1, 2018. ↑ Jensen, Trevor (March 31, 2007). "David Green: 1922–2007". Chicago Tribune. Retrieved September 1, 2018. ↑ "Heinz Schiller". Grandprix.com. March 27, 2007. Retrieved September 1, 2018. ↑ "Sylvia Heschel, pianist, widow of Jewish scholar". The Boston Globe. March 27, 2007. Retrieved September 1, 2018. ↑ "Actor Mikhail Ulyanov Dies in Moscow". Kommersant . March 26, 2007. Archived from the original on September 30, 2007. Retrieved September 1, 2018. ↑ Masters, Christopher (May 4, 2007). "Hans Hedberg". The Guardian. Retrieved September 1, 2018. ↑ "Nobel Laureate and Pitt Alumnus Paul C. Lauterbur Dies at 77". University of Pittsburgh . March 27, 2007. Archived from the original on October 15, 2007. Retrieved October 15, 2007. ↑ Sullivan, Patricia (March 29, 2007). "Biologist Ransom A. Myers, 54; Warned of Overfishing in Oceans". The Washington Post. Retrieved September 1, 2018. ↑ "Ejecutan a capo duranguense del cártel de Sinaloa". El Siglo de Durango (in Spanish). March 28, 2007. Archived from the original on February 17, 2018. ↑ "Faustino Oramas, 95; singer was a member of Buena Vista Social Club". Los Angeles Times. March 29, 2007. Retrieved September 1, 2018. ↑ Veitch, Harriet (April 16, 2007). "She fought disease despite risks - Obituaries". The Sydney Morning Herald. Retrieved September 1, 2018. ↑ "Morto Joe Sentieri". La Stampa (in Italian). March 27, 2007. Archived from the original on October 15, 2007. Retrieved April 1, 2007. ↑ Hoffman, Lisa (March 28, 2007). "Last WWI woman veteran dies". Knoxville News Sentinel . Archived from the original on May 25, 2007. Retrieved September 1, 2018. ↑ "Press Release: Dr. Cha Chi Ming passed away". HKR International. March 28, 2007. Archived from the original on May 6, 2007. Retrieved September 1, 2018. ↑ "Oldest pro wrestler passes away today". Wrestling Observer. March 28, 2007. Archived from the original on April 2, 2007. Retrieved September 1, 2018. ↑ "Former USC, NFL player Fisk dies at 90". ESPN. March 29, 2007. Retrieved September 1, 2018. ↑ "Sir Thomas Hetherington". The Daily Telegraph. March 30, 2007. Retrieved September 1, 2018. ↑ "Jazz musician Tony Scott dies". CBC Arts. March 31, 2007. Archived from the original on November 20, 2007. Retrieved September 1, 2018. ↑ "Obituary: James E. Thorpe". Positive Choices.org. March 29, 2007. Archived from the original on December 22, 2014. Retrieved September 1, 2018. ↑ "Nigerian presidential candidate dies". Mail & Guardian . March 29, 2007. Archived from the original on September 30, 2007. Retrieved September 1, 2018. 1 2 Ramesh, Randeep (March 30, 2007). "Bangladesh executes six Islamic militants". The Guardian. Retrieved September 1, 2018. ↑ "Last WWI Navy vet dies in Md. at age 105". Yahoo! News. April 1, 2007. Archived from the original on April 5, 2007. Retrieved September 1, 2018. ↑ "Murió Juan Joya Cordero". LaRed21. March 30, 2007. Retrieved September 1, 2018. ↑ Heydarpour, Roja (April 14, 2007). "Mimi Lerner, 61, Opera Singer With an Unconventional Career, Dies". The New York Times. Retrieved September 1, 2018. ↑ "We Remember Calvin Lockhart: Nassau-born actor died Thursday at the age of 72". EURWeb.com. April 4, 2007. Archived from the original on July 13, 2007. Retrieved September 1, 2018. ↑ Blomfield, Simon (April 22, 2007). "The Venerable Myokyo-ni". The Guardian. Retrieved September 1, 2018. ↑ "Former President Nakayama dies in Hawaii". Official Site of the FSM President. April 2, 2007. Archived from the original on September 27, 2007. Retrieved April 2, 2007. ↑ Hawtree, Christopher (April 18, 2007). "Leslie Waller". The Guardian. Retrieved September 1, 2018. ↑ Ham, Paul (April 19, 2007). "A romantic hero in war and peace - Obituaries". The Sydney Morning Herald. Retrieved September 1, 2018. ↑ Yusoff, Mohd Nasir (March 30, 2007). "Indonesian Music Legend Chrisye Dies". Malaysian National News Agency . Archived from the original on September 29, 2007. Retrieved September 1, 2018. ↑ "Candystripes favourite Coyle dies". BBC News. March 30, 2007. Retrieved September 1, 2018. ↑ "Michael Dibdin". The Daily Telegraph. April 4, 2007. Retrieved September 1, 2018. ↑ "Elhunyt Fehérvári Alfréd". Kisalfold.hu (in Hungarian). March 31, 2007. Retrieved September 1, 2018. ↑ Gunson, Phil (April 9, 2007). "María Julia Hernández: Leading human rights activist in El Salvador". The Guardian. Retrieved September 1, 2018. ↑ "Ilias Kelesidis". Sports Reference. Retrieved September 1, 2018. ↑ "Dave Martin". The Daily Telegraph. April 17, 2007. Retrieved September 1, 2018. ↑ Chung, Matthew (April 1, 2007). "Ex-cabinet minister led acid rain fight". Toronto Star . Archived from the original on September 29, 2007. Retrieved September 1, 2018. ↑ "Patricia Barringer". All-American Girls Professional Baseball League . Retrieved March 29, 2019. ↑ "2007 Obituaries: Phil Cordell". Phil Brodie Band. Archived from the original on March 21, 2008. Retrieved September 1, 2018. ↑ James, Meg (April 5, 2007). "Tom Moore, 88; ABC chief gave TV sports a high profile, zeroed in on baby boomers". Los Angeles Times. Retrieved September 1, 2018. ↑ "RP boxer Sisnorio dies after getting KO'd in Bangkok". Asian Journal. April 2, 2007. Archived from the original on September 29, 2007. Retrieved September 1, 2018. ↑ "Psychologist Paul Watzlawick dead at 85". EUX.TV . April 2, 2007. Archived from the original on September 30, 2007. Retrieved September 1, 2018.